We ran a t-shirt design contest this year with the CHS art department for our T-shirt design. There were a lot of wonderful submissions but we narrowed it down to 2 and then decided we had to combine them. So congratulations to Kimberly Felty and Shania Garza for winning the contest, we combined their designs to come up with our shirt. We are very pleased! 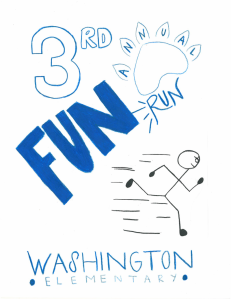 Remember you can still sign up for the Fun Run up until April 16th, to get a t-shirt. After the 16th you may still do the run at a reduced cost of $3.00, but will not receive a shirt. The Marines will be there again this year and healthy snacks will be provided afterwards. It is going to be awesome!!! !